Simple techniques and recycled materials...how can you beat that? A fabulous manual that will take you through beginner techniques right into intermediate. Surface effects for fabrication artists who have mastered the basics. 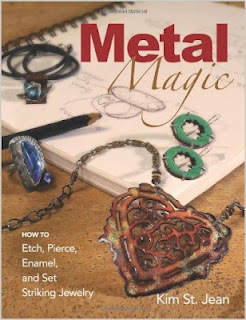 An amazing section on adding patinas to metal. Picks up where Kim's first book left off. Great projects and techniques. Merge your chain mail mania with other materials, like textured metal. Want to add creative metalwork to your beaded designs?